Just sharing a shocking news who posted by one of the Duterte's supporters where according to him that there's a plan before the 2016 Philippine polls to kill the Davao City Mayor Rodrigo Duterte. An Facebook post was shared by thousands of his supporters to alarm the other believers. An FB post was shared on a 'MayorDuterte4President' group by Francis Bundoc Besin who received the report of a plot to kill Mayor Duterte. He explained everything how the assassination will be happen if the report is really true. 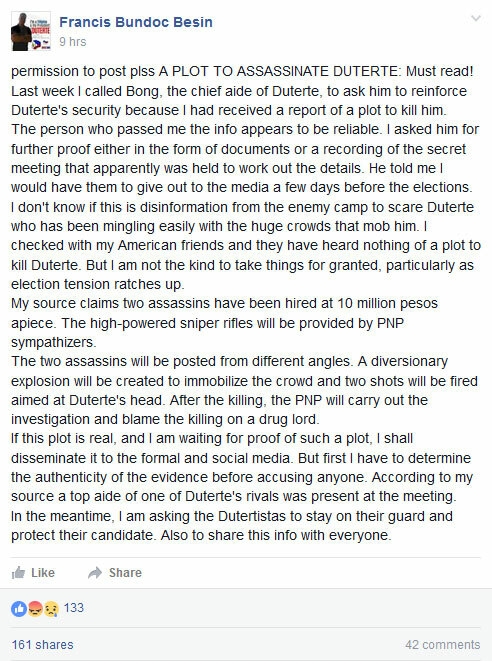 As of writing this post, Besin posted on the said group today, April 20, 2016 at 12 A.M. (Philippine Time), the story about assassination. Last week I called Bong, the chief aide of Duterte, to ask him to reinforce Duterte's security because I had received a report of a plot to kill him. The person who passed me the info appears to be reliable. I asked him for further proof either in the form of documents or a recording of the secret meeting that apparently was held to work out the details. He told me I would have them to give out to the media a few days before the elections. I don't know if this is disinformation from the enemy camp to scare Duterte who has been mingling easily with the huge crowds that mob him. I checked with my American friends and they have heard nothing of a plot to kill Duterte. But I am not the kind to take things for granted, particularly as election tension ratches up. My source claims two assassins have been hired at 10 million pesos apiece. The high-powered sniper rifles will be provided by PNP sympathizers. The two assassins will be posted from different angles. A diversionary explosion will be created to immobilize the crowd and two shots will be fired aimed at Duterte's head. After the killing, the PNP will carry out the investigation and blame the killing on a drug lord. If this plot is real, and I am waiting for proof of such a plot, I shall disseminate it to the formal and social media. But first I have to determine the authenticity of the evidence before accusing anyone. According to my source a top aide of one of Duterte's rivals was present at the meeting. In the meantime, I am asking the Dutertistas to stay on their guard and protect their candidate. Also to share this info with everyone. As of the moment, the story was not confirmed if its real or not but according to him it is better to be always alert and on guard in every second for the sake of the life of their Presidential candidate Rodrigo Duterte. What do you think on this information about the plan of killing Duterte? Share your thoughts below. 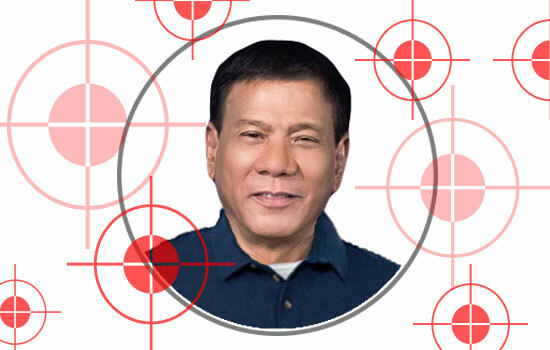 Comments or suggestions about "MUST READ: A Plot to Assassinate Rodrigo Duterte" is important to us, you may share it by using the comment box below.